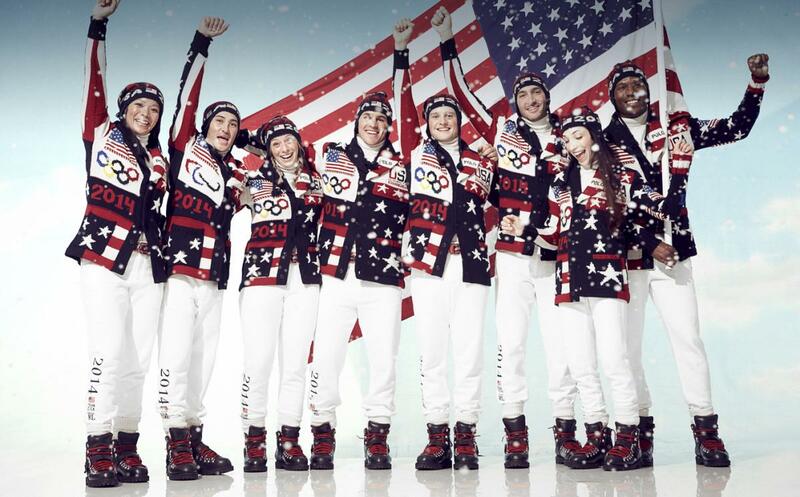 I'm on the couch, remote in hand, wine is poured (a 2010 Cabernet - a nod to the previous Winter Olympics, of course!). I'm ready! Are you?! I. LOVE. THE. OLYMPICS. 7:30PM: Tonight's theme, clearly "Russia is Awesome." I do appreciate some cultural context, but this feels a bit like a propaganda filmstrip. 7:33PM: However, I do LOVE an Olympics highlight reel. Think this opening was really nicely done. "Winter not a burden, but a theater." Boom. 7:35PM: I'm glad to see that my buddy Bob Costas is not shying away from the politics involved this year (even with the eye infection!). He's going as far as to question issues of terrorism, human rights concerns, the "staggering" cost of the games, and even the choice of Sochi in the first place. He's even interviewing President Obama later in the broadcast. Example #1: The Fisht Olympic Stadium is the ONLY stadium ever custom-built for an Opening Ceremony, and will ONLY host the Opening and Closing Ceremonies. Seems wasteful to me. 7:40PM: For me, the Obama interview and Maria Sharapova mini-docs are not necessary . . . I'm eager for the big show! Did you know that the Production Designer of tonight's show George Tsypin also worked on the oft-OTT "Spiderman: Turn off the Dark"? 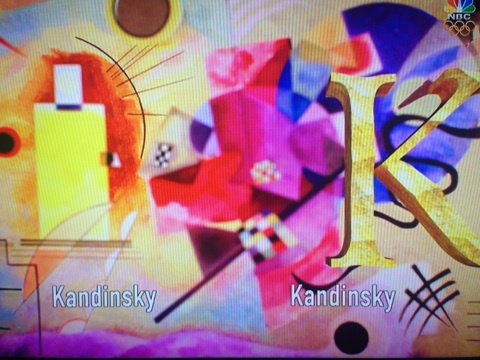 He developed the show in his Queens, NY warehouse and considers himself an "American Artist" but was born in Kazakhstan. There may be a quiz later. 8:03PM: Here we go! Backstage with Team USA. I need one of these sweaters! 8:08PM: Let's talk Fisht Olympic Stadium, shall we? The built-in aerial gantry system (described as a BIG, multi-million dollar dry cleaner-like track system) will be carrying and moving the set pieces during the show. Some 200ft long and up to 6 stories high! It has a 137 ton capacity. 8:15PM: I like the video to start with dream-like animations highlighting some of the most notable Russian icons. 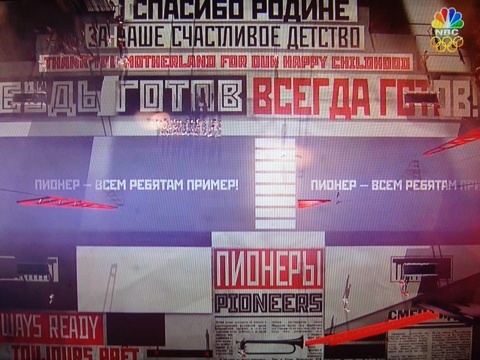 Something like an ABCs of Russia (Chekov, Kandinsky, Periodic Table, Sputnik . . .). The fireworks outside the stadium bring it back to the venue where we see what's becoming more and more a mainstay of these arena shows, RFID graphics using the audience as a canvas. 8:20PM: The lighting is INCREDIBLE. Simple scenery made just stunningly beautiful. Seamless projection on the floor, islands of Russian countryside. This seriously brave little girl flying through the air of this massive arena. Not translating so well on TV, maybe it's better in the live audience? And here come the costumed Russians! That's a lot of haze, y'all, and we have some indoor snow! 8:25PM: OUR FIRST OBVIOUS GLITCH! 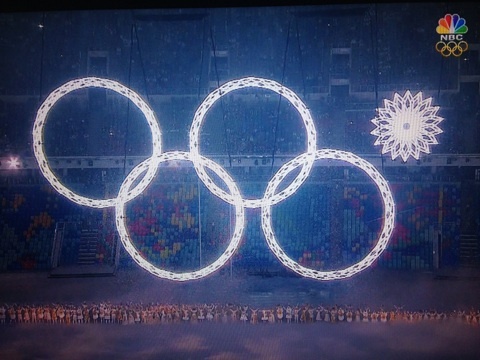 One of the snowflakes, turned Olympic rings fails to open :( That's a bummer, would have been super cool. 8:27PM: And now it's time for a bunch of people to be introduced….anthems, etc. I think it's really odd that the entire lower section of seats is totally empty. Maybe it's a safety thing, but it's the background of so many camera shots seems like an odd choice. Red, Blue, and white, lighting effects during the Russian national anthem, paired with the flag made of glowing Russian children is actually pretty cool. Oh, it WAVES! Nice touch, guys. 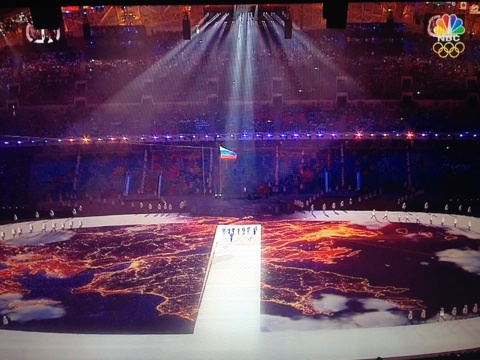 CORRECTION: Apparently, the empty seats are for the athletes…thanks Meredith Vieira! 8:35PM: Ooooohhhh animated globe on the floor AND hydraulic ramp in the floor allowing each team to literally walk out of the map into the arena. Graphics change for EVERY nation. Nice. I actually love that Greece always goes first. Reminder of the long history of the games, and I think it's super cool. Digging the Russian club remix happening. Very fun! Definitely the most entertaining parade of nations I've seen. And we're walking . . . and walking . . . and walking . . . and the yeti people are dancing, and the ice queen human signs are marching . . .
8:48PM: And finally, here comes the Russian team . . . sounds like they're under A LOT of pressure to perform out there. Good luck, guys! SPOTTED: The RFID devices are medallions (kind of like an Olympic medal) around the necks of the audience members. 9:15PM: TOTALLY digging the Hobbit/LOTR flashback-style of the 1,000 years of Russian History in 3 minute video. 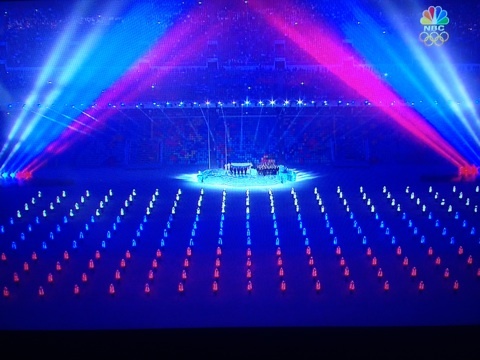 Not sure I remember seeing so much video during an Opening Ceremony before? 9:55PM: The slowly galloping horses above the wind-blown snow projection (and live snow too!) on the floor is just amazing. 120 projectors used to create this seamless "multidimensional painting" on the floor. Incredible! The inflatable city and windsock guys, not really my thing. I like the colors, but a little silly. 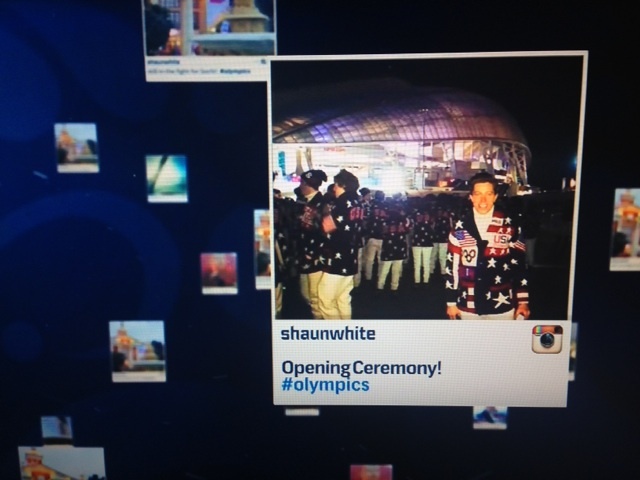 10:00PM: Love seeing the instagrams of the US Olympians as we go into commercial break! 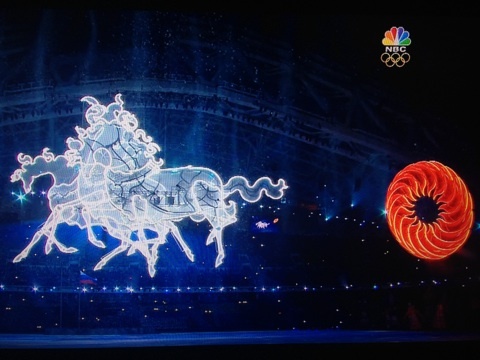 10:04PM: Ok, the projected ship of Peter the Great is SICK. Real men aboard a projected ship. SO COOL. The crew disappears "below deck" with another door in the floor. Loved that! The interplay of projection and live people is so clever and unique, and continues to an awesome map of St. Petersburg . . . like they are marching around the city. LOVE. 10:11PM: So we have about an hour left, and it's still feeling very focused on Russia's past. Think they should be doing more looking to the future sometime soon here though I am liking the War and Peace ballet, and the continued twinkling of the RFID medallions in the audience. 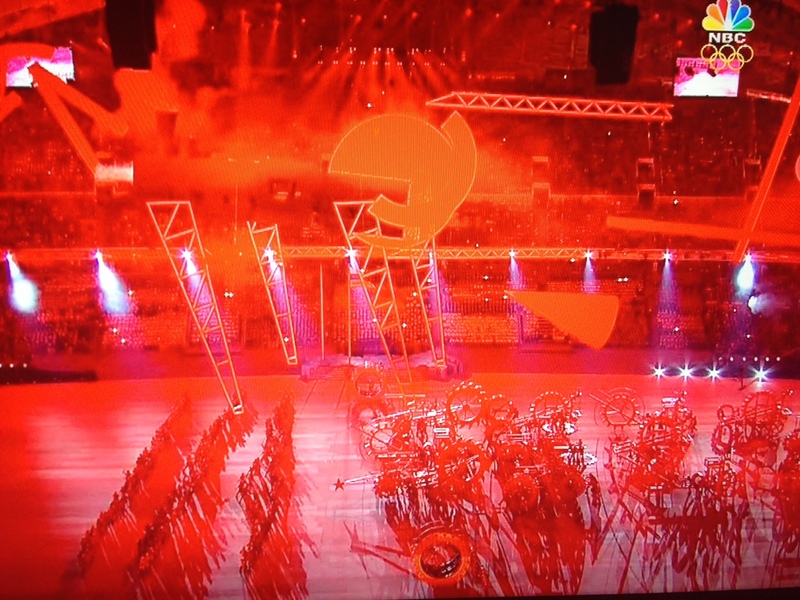 10:21PM: Here comes the propaganda train…properly RED and tense music and lighting for the Soviet Era. I really like this moment at the end with the white light flooding the arena, sound effects of war, possibly too subtle? 10:27PM: Total mood shift. We hear the sounds of rebuilding along with visual of blueprints. Modernization . . . and here come the Russian hipsters! Not into the weird floating heads. We're back to propaganda filmstrip territory a little bit. 10:34PM: I'm going to use this commercial break to make myself some hot chocolate. I know, you're jealous. Be right back! Aww man, more speeches?! Like the iceberg-looking stage. Ok, now the shot looks AMAZING with the Athletes behind the Olympic Committee President. Good call, guys. 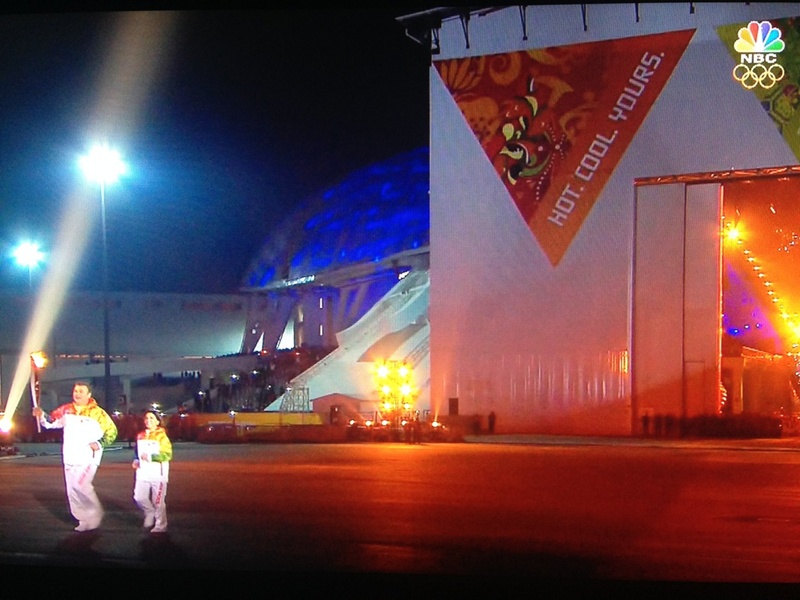 10:41PM: The Olympics have officially OPEN! 10:43PM: Not really getting the jellyfish Swan Lake?! Anyone? 10:49PM: And here comes Belle from Beauty and the Beast to sing the Olympic anthem…Ok, I'm bored. 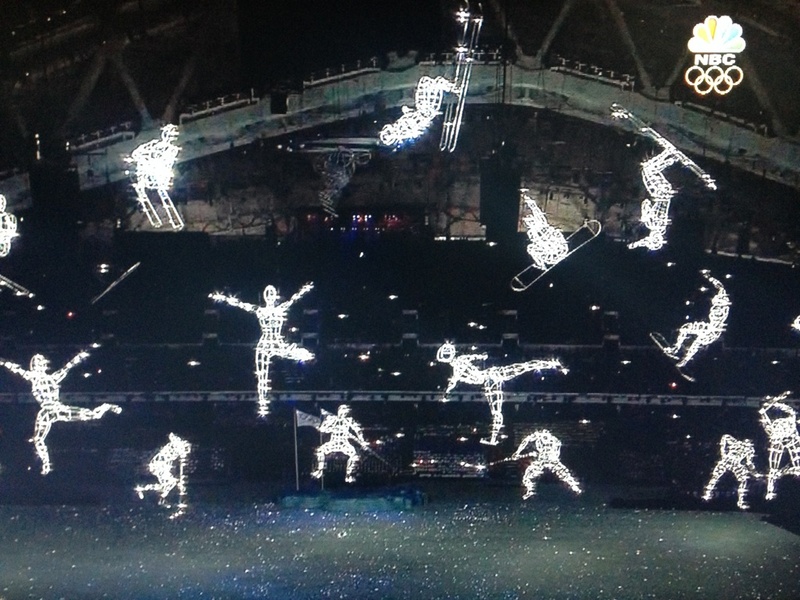 10:59PM: Back to the show with some ice skating constellations. Is that a hockey player in the sky?! This was a fun segment with the lighting stop-action athletes in the air. Ok . . . now it seems like they've been running for an awkwardly long time. SO. MANY. FIREWORKS. I love the sparkly pool around the flame. FINAL THOUGHTS: All in all, it was a great show! Great use of technology and projection, thoughtful scenic pieces. 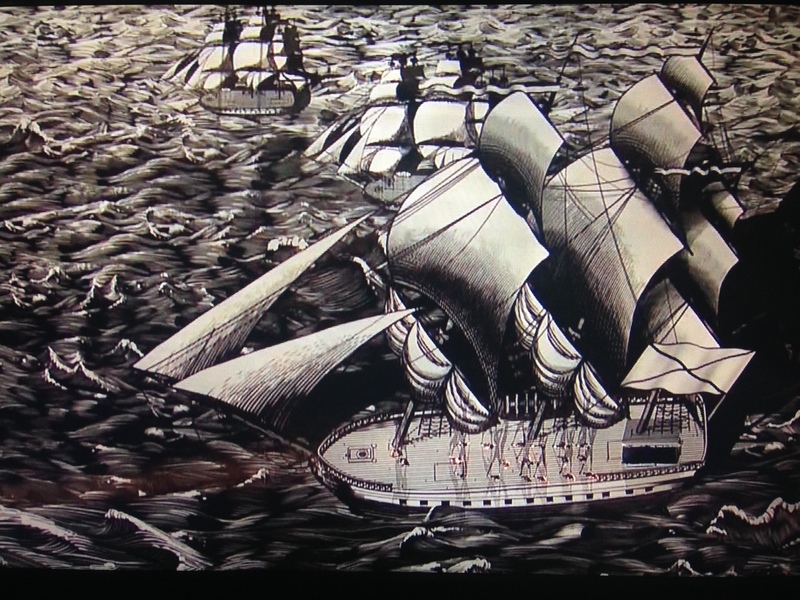 Favorite was Peter the Great's ship with rough sea. The biggest thing missing for me was in the story arc. We basically ended Russian history in the 90s and never really touched on the future. Seems like a missed opportunity to show the world something new about themselves. Can't wait to enjoy the Olympics for the next 18 days!